Many homes have trees, that have been there for a significant number of years. On occasions, the tree starts growing in a way that is not healthy for itself,and it might be unable to support its own weight. Because the tree has become a member of the family so to speak, the homeowners don’t want to have it removed. Professional tree companies can intervene and use tree cabling or bracing in a way that helps the tree to grow straight, or to support the weight of the offending branches. This is the most common defect you find in trees, and it is where two large branches share the same area of the trunk. When these grow in size in a V shape, there is an element of concern because it can lead to splitting, and hence the branch falls. Our professionals know all about the stress on these unions and the best action to take if any is required. This occurs when the two branches are fighting between each other,and then the trunk gives way through the continual stress. If this happens gradually a tree might grow bark over the crack so to the untrained eye, there is nothing to worry about, but underneath the crack can be worsening. Holes can occur in trunks or branches and will be a weak point. They can also happen for a number of reasons and go undetected for years. Once the bark is removed, and the interior wood is exposed, it begins to decay, and can become infested with insects which make the problem worse. Tree cabling supports trees that have structural defects such as the co-dominant stems or branches as well as cracks and holes. Tree cabling is used to support the dangerous parts of the tree to other parts that are healthy. There are two forms of cabling systems that Las Vegas Tree Removal Pros can offer to support a tree. Static cabling – this has no give and is fastened to the tree usingeye hooks, wire stops, or lag hooks. These are used when there should be no movement in the area of the tree. Dynamic Cabling – These are more flexible and use a rope, which is specially braided and has elastic qualities. This allows movement because when trees move with gusts of wind, they build their size by producing more wood. This type of cabling is more of a proactive means compared to a preventative measure. This method is carried outnear the union, which is failing. The process is straightforward once the number of rods required has been determined to support the weight. Next, holes are drilled all the way through the tree, and then washers and bolts are tightened to the tree on both ends. On many occasions, cabling is used in conjunction with bracing, over time the tree will develop new tissue that will grow around the bolts used, and the anchor point will become stronger with less chance of any branches falling. 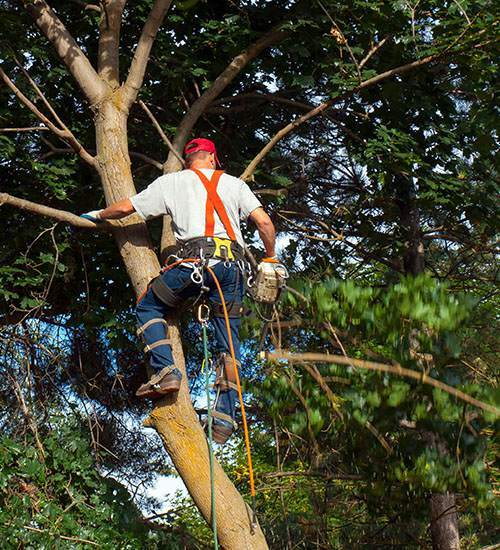 Las Vegas Tree Removal Pros offer the very best in tree cabling and bracing, and have for years helped numerous homeowners keep their beloved trees that they thought would have to be cut down.